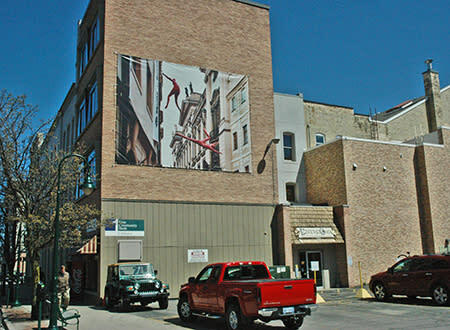 Look Up and Don&apos;t Miss the Art Banners in Downtown Traverse City! You may already have seen them while walking or driving through Downtown Traverse City, spread across the otherwise blank walls of banks, stores and other buildings. A massive portrait of Ernest Hemingway -- a Japanese print of breaking waves, a strangely compelling picture of two urban acrobats like twin Spidermen, and a colorful abstract that seems to convey the joys of sailing. They’re just the most recent installations in the Traverse City Art Banner Project, a collaborative effort by the Dennos Museum Center at Northwestern Michigan College, Britten Studios, and a host of private donors and businesses who like the idea of public art. 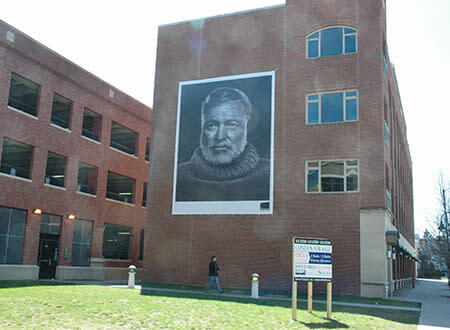 Since late 2014, when the first giant canvas went up on the side of the Lake Michigan Credit Union building on West Front Street, there have been artworks appearing and disappearing on downtown sites – and there&apos;s even one in nearby Greilickville. 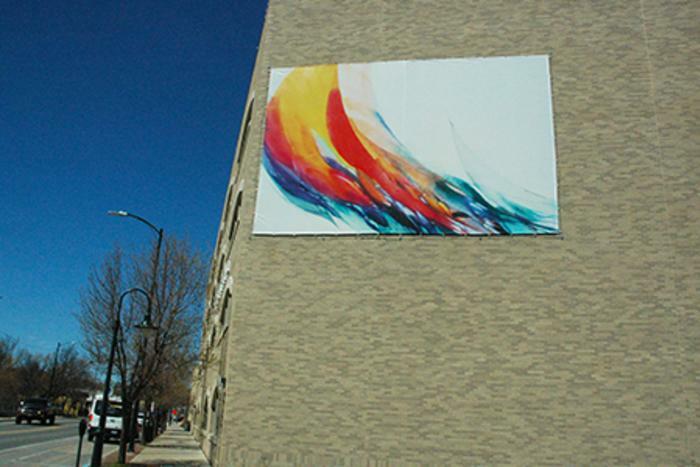 Soon the project widened both in the number of available sites and the scope of available art, which include art pieces by former NMC art students and other local artists – like Madonna Walter’s breezy “Run Before the Wind,” which is on the credit union building now, and Calvin Boulter’s playful “A Space-Time Continuum” on Union Street. 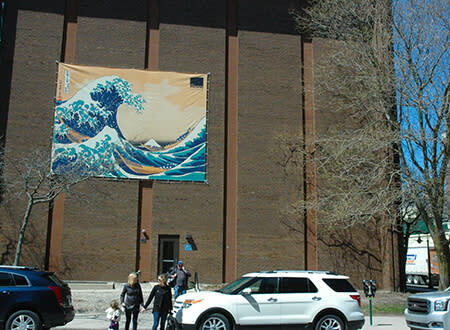 There’s also imagery from the Dennos Museum’s extensive collections, which is how Yousuf Karsh’s iconic Hemingway portrait and the equally recognizable “Under the Wave off Kanakawa” by Katshushika Hokusai ended up on walls near the corner of Front and Park Streets. Two more images from the Dennos Museum collection -- “Sleeping Fox” by Charles Culver and Douglas Hoagg’s "Untitled" -- can be spotted on the side of the Leelanau Studios building (the former Norris Elementary School) at the corner of M-22 and Cherry Bend Road. To be fair, this isn’t the first effort to cover some of the city’s bare walls with artwork. The rear wall of the State Theatre, for instance, has been sporting a familiar scene from the classic Harold Lloyd silent film “Safety Last” for years. An even more intensely local piece of artwork -- in every sense of the word -- can be found on the side of Maxbauer’s Ace Hardware store on West Front Street. It’s an immense 13x50-foot mosaic version of Charles Murphy’s painting “Festival Time,” which was actually the 2008 commemorative poster for the National Cherry Festival. The subject matter, an impressionistic view of the festival and the buildings of downtown Traverse City as seen from the water, is only part of the story. 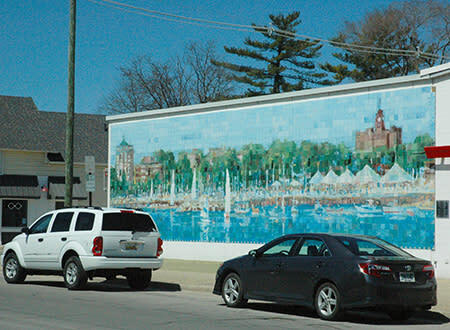 The entire “canvas” was created by ArtCenter Traverse City in a massive 2010 community effort where attendees at local art events were invited to paint six-inch aluminum tiles to be used in the final mosaic. In the end, 1,600 people painted 2,600 tiles, which were assembled and attached to the wall of the store under the direction of Kingsley muralist Terry Dickinson, using Murphy’s painting as a template. The final installation was dedicated to the memory of the store’s founder, John A. Maxbauer, who died during the completion of the project at the age of 90.